J.R.C.S. 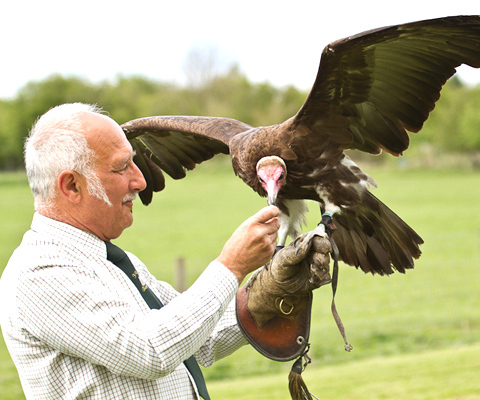 Falconry provides static and flying displays throughout the year. We are available for shows, fetes, children’s parties, after dinner speaking and talks and we regularly visit schools, clubs and garden centres. With our selection of eagles, falcons, hawks and owls, we provide a display to be admired. Whether static or flying, the birds are impressive and thrill all that come to see them. Our static displays are set up for a period determined by the venue; and we can also supply our own cover and protection for the birds, as required. All our birds are set out with individual identification plaques; and short informative talks on their habits and natural habitat are delivered throughout the day. We’ll agree the details of our flying displays in advance of the event. Our speciality is audience participation where adults and children can experience the silent flight of Solo the barn owl, see Sas the falcon swoop to the lure and feed Q the Hooded Vulture.